Beginning in the late 1820s, an extended period of growth and prosperity began in the United States. Although based largely on land speculation, this expansion was intensified by a series of gold strikes that brought new wealth to parts of northern Georgia and the Carolinas, California, Oregon, and finally Colorado. Despite their vast geographical differences, all of these areas had similar economic interests and shared common problems. From each it was hazardous and costly to transport gold dust to Philadelphia for assay and coining. This in turn led to local economies based largely on barter or the use of “pinches” of gold dust, a notoriously inaccurate method for simple commercial transactions. As in the nation at large, there was a shortage of circulating coinage before the gold strikes, which became acute with the sudden influx of thousands of miners. And most importantly, all of these minerally wealthy regions were ignored by the federal government, whose prerogative it was to strike coinage and establish mints. While the U.S. Constitution expressly prohibited the states from issuing their own money, there was no law against individuals doing so. 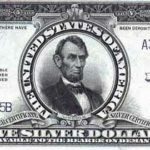 Private individuals and companies quickly stepped in to fill the void left by the federal government, producing coins and ingots referred to by numismatists as pioneer or territorial issues. The first major U.S. gold rush began in 1828 with the discovery of large deposits in Georgia and North Carolina. In 1830, Georgia gunsmith turned assayer Templeton Reid became the first to privately mint gold coins. 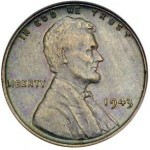 Reid made ten, five and two-and-one-half dollar pieces, all of which are very rare today. Later in the same year a German immigrant family of jewelers named Bechtler began to turn Georgia and Carolina gold into gold dollars. Bechtler gold was produced for eighteen years in three denominations: one, two-and-one-half, and five dollars. After 1834 there are three “location stamps” found on the Bechtler coins: NORTH CAROLINA GOLD, CAROLINA GOLD, and GEORGIA GOLD. Rather than denoting the origin of the ore used, these stampings are indicators of the typical fineness of the gold, respectively 20, 21 and 22 carats. Although Bechtler gold was highly regarded throughout the South for years, after the passing of founder Alt Christoph Bechtler and his son August, in 1846 the firm was handed over to Christoph Jr., and his drinking problem obviously got in the way of business. This is reflected in the debasement and discrediting of Bechtler coins during the last two years of production. After James Marshall’s discovery of gold in California in 1848, a number of private minters jumped in to supply the ever-escalating need for a circulating coinage in that region. By the end of 1849 there were approximately eighteen of these private operations at work, almost all located in the San Francisco area. Coinage by these minters fell off sharply after the opening of the Assay Office and later, the San Francisco Mint. Like the Mormons of Utah, the territory of Oregon also found it had to deal with the problem of gold dust from California. In the spring of 1849, eight partners established the Oregon Exchange Company in Oregon City. The firm struck 6,000 five-dollar coins and an estimated 2,850 ten-dollar gold pieces, all featuring a beaver as the central design motif with the remainder of each side taken up with statutory legends. 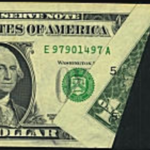 The five-dollar pieces have obvious errors in two of the legends that reflect the hurried conditions under which the coins were struck. The obverse displays the initials of the company’s eight partners, but partner Gill Campbell’s initial was cut into the die as G. rather than C. The second error was a mispunching of T.O. for Territory of Oregon rather than the more conventional O.T. for Oregon Territory. Both errors were corrected on the ten-dollar coins. As with the Mormon gold coins, the Oregon “Beavers” were struck from unalloyed gold. To compensate for any possible deficiency in fineness, the coins were made heavier than federal gold pieces. However, unlike the coins struck in Utah, Oregon “Beavers” actually contained more gold than their stated face value. But like most other early private gold issues, the Oregon coins suffered from guilt by association and were deeply discounted. Virtually all were melted and survivors are seldom seen. Another short-lived entrant in the game of coining Colorado gold was Dr. John D. Parsons, who in partnership with a Mr. Black formed Parsons & Company. Setting up his assaying and minting equipment in the community of Hamilton, Parsons produced a very small output of his gold coins and ingots around June of 1861. His quarter eagles and half eagles bore on their obverse the image of an ore-stamping mill, with the legend J. PARSON (sic) & Co. (the $5 piece spelled his first name JNo), as well as the single word ORO, Spanish for gold. The reverse of each coin displays an eagle with outstretched wings, copied from the federal coinage. The legend PIKES PEAK GOLD and the coin’s value surrounds it. As with Conway & Co., Dr. Parson’s operation was of short duration. 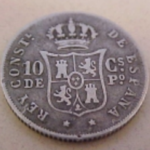 It produced very few coins, and less than a dozen pieces are known today for both denominations combined. The most productive coiner of Colorado gold was the firm of Clark, Gruber & Co. The company struck their first year’s coins from unalloyed native gold, but soon found that they abraded too easily. For the second year’s production in 1861, alloy was added to harden the coins for circulation, but in both years this remarkably scrupulous company made its coins 1% heavier than federal issues. Clark, Gruber & Co. struck two-and-one-half, five, ten, and twenty-dollar gold pieces in both 1860 and 1861. 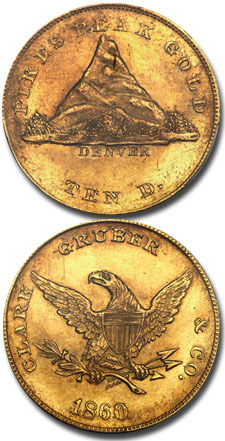 The coins were modeled after the U.S. gold coins of the period except for the ten and twenty-dollar issues of 1860, which featured a fictitious view of Pike’s Peak on the obverse. Apparently these dies were engraved in the East by someone who had never seen the famous mountain. Its depiction on the coins resembles a volcanic cone rather than the reality of one high mountain in a long chain. In 1862, Clark, Gruber closed its offices, selling its machinery to the Denver Assay Office in anticipation of the opening of a federal mint in that city (which did not occur until forty-four years later). The final curtain came down on private coinage and territorial gold coins with Congress’ passage of the Act of June 8, 1864. 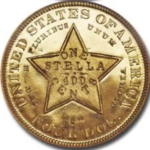 Intended to stop the minting of Civil War tokens, this legislation prohibited the private manufacture of any coins designed to pass as money.